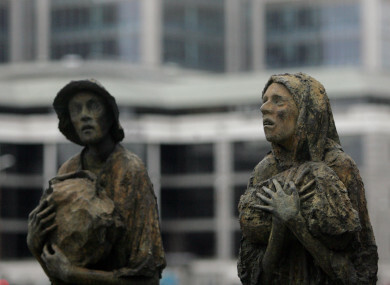 A NATIONAL COMMEMORATION day to remember the Great Irish Famine is set to be held on the third weekend in May every year. A Sinn Féin Bill which aims to hold a Famine memorial day on the same day each year is due to be opposed by government this week. This is due to Fine Gael’s Colm Brophy making a similar proposal last year and it being further advanced. The day put forward by Brophy was the second Sunday in May every year, however, it is now understood the government is investigating what would be the “ideal date”. It is believed it will now be held over the third weekend in May to ensure it does not clash with any other events. We need a fixed date for a number of reasons. It will allow everyone to work towards the commemoration, on a yearly basis, and allows schools to make it part of the school curriculum. Over one million people died of hunger and related diseases during the famine, while two million fled the country. The day will not be classed as a bank holiday. The Sinn Féin Bill, put forward by Peadar Tóibín, will be debated in the Seanad today. Email “National commemoration day for the Great Famine set for May 2019”. Feedback on “National commemoration day for the Great Famine set for May 2019”.